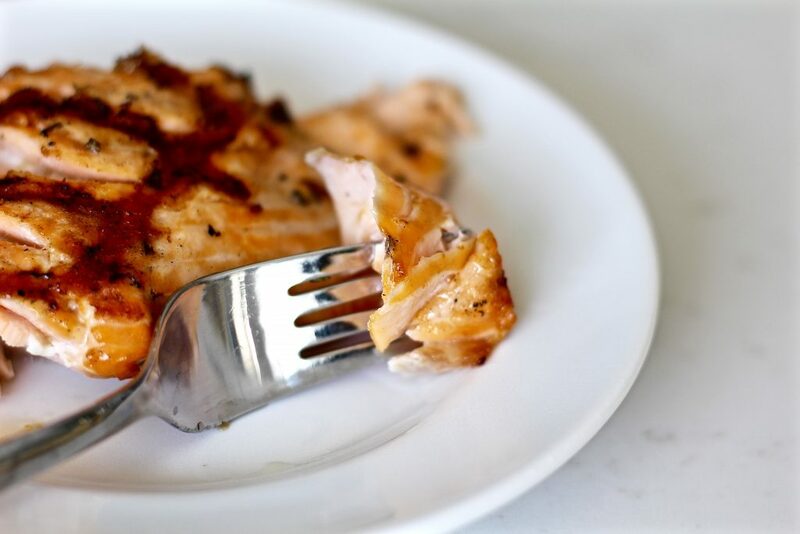 This juicy grilled garlic rosemary salmon has been my go-to recipe for salmon ever since we got a propane grill. I love how quickly it cooks and that I don’t have to commit to my house smelling like fried fish for the next day. 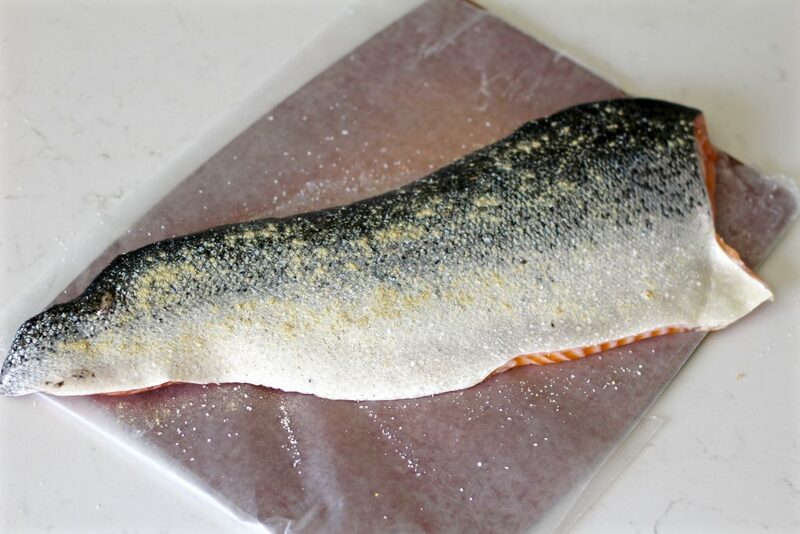 If a recipe requiring you to bake salmon tightly wrapped in foil for an hour makes you raise an eyebrow; you’re not alone. IT SHOULDN’T TAKE THAT LONG! 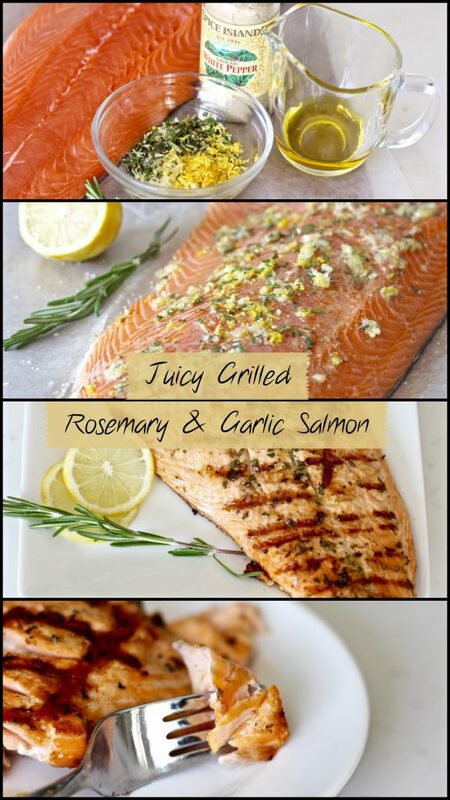 This juicy grilled garlic rosemary salmon is full of amazing flavor and takes LESS THAN TEN MINUTES on the grill! 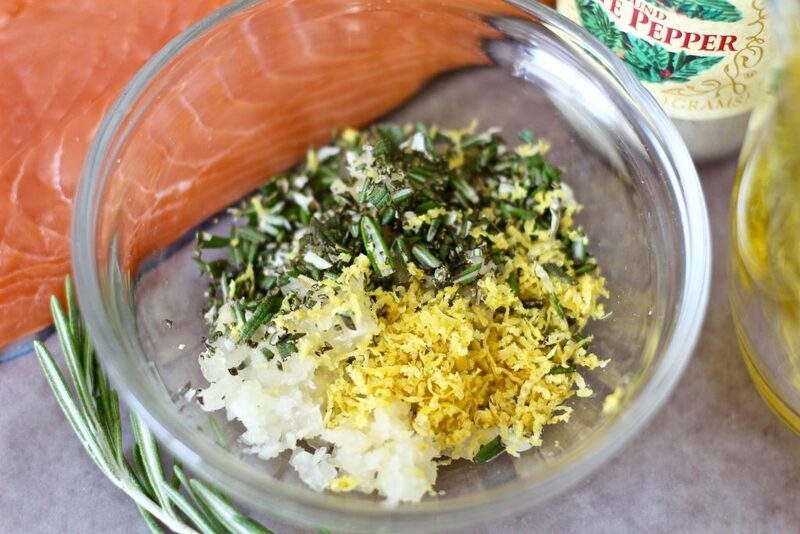 Seasoning with the right amount of salt and pepper then adding the fresh garlic, rosemary, and lemon zest/juice creates a wonderful, savory flavor that goes great with some risotto or garlic mashed potatoes. 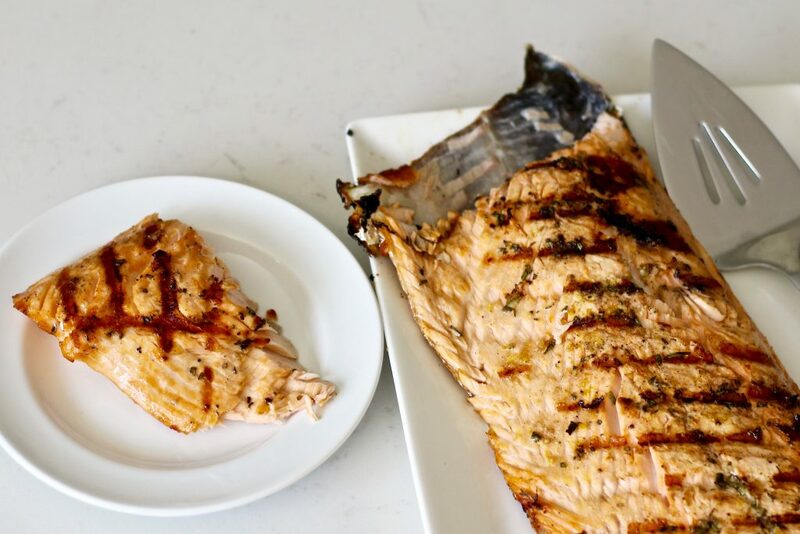 Try making this flavorful, juicy grilled garlic salmon for dinner next time you grill out! 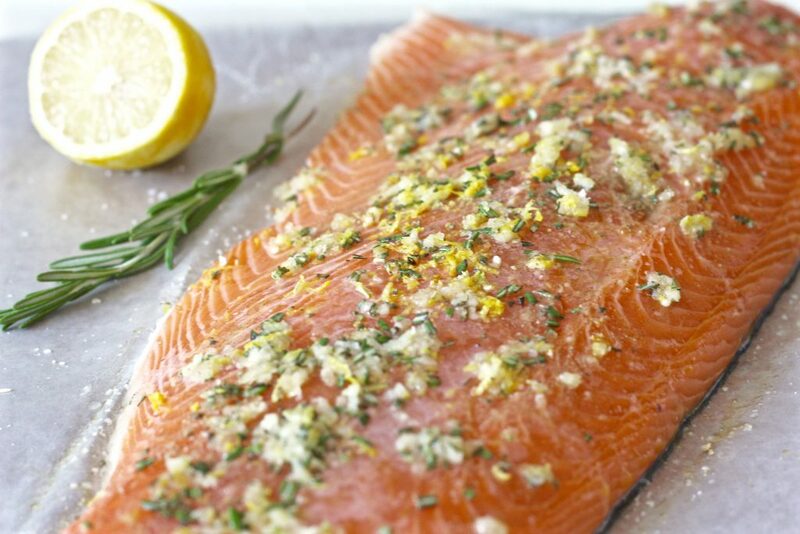 Do you prefer a sweeter seasoning for salmon? 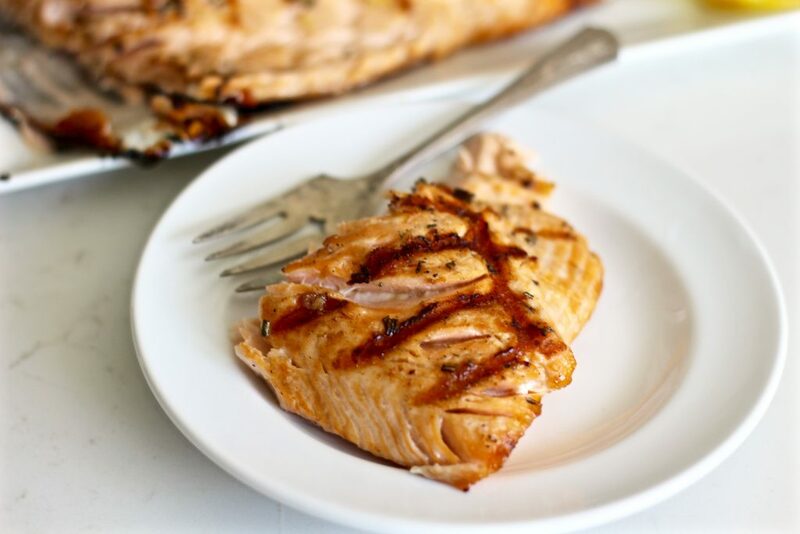 Try this amazing honey garlic bourbon glazed salmon! If you don’t like eating salmon with the skin on, don’t worry! The meat slides right off the skin after it’s grilled. 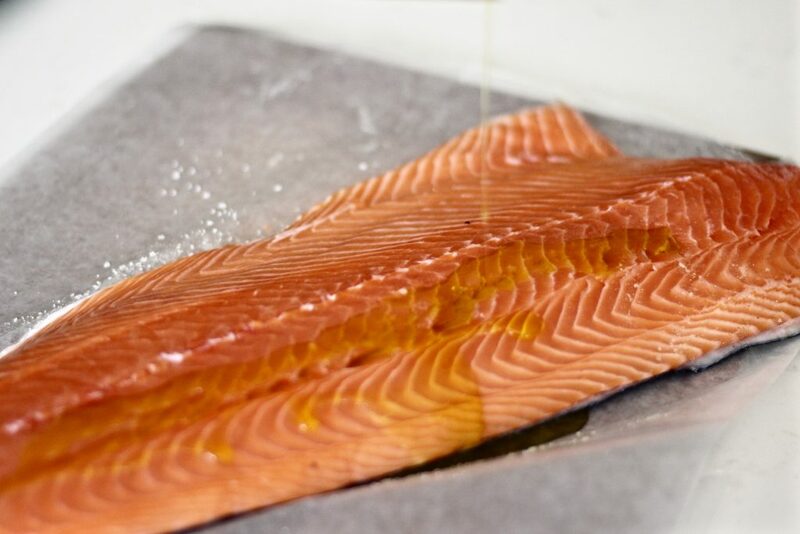 This way you don’t have to pay extra for a skinless fillet, don’t have to worry about cutting off the skin while the salmon is raw, and get to keep the meat extra juicy despite high grilling temperatures! 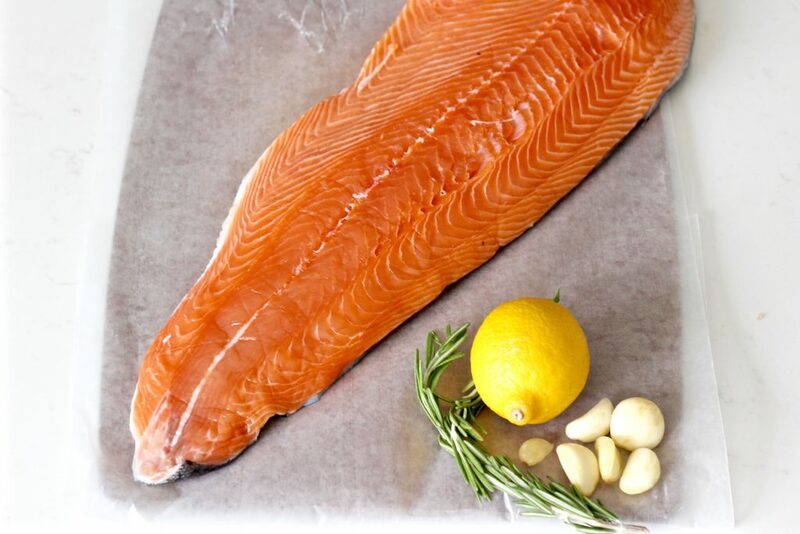 Prepare the salmon fillet by pat drying it with a paper towel. Start by lightly seasoning the skin side with salt and white pepper. 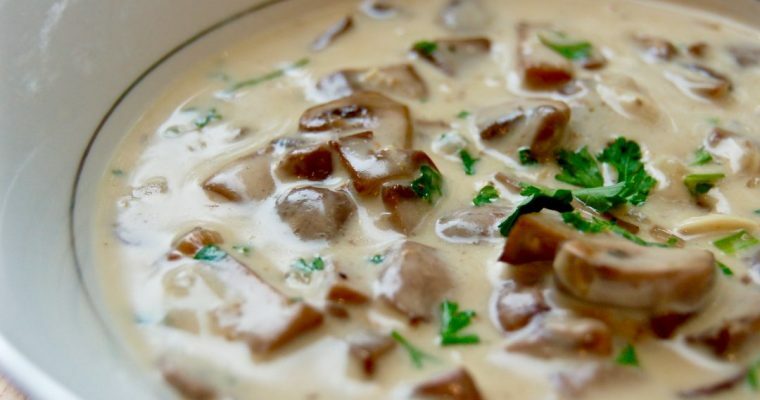 White pepper has a milder, more delicate flavor than black pepper and won’t overpower seafood dishes. If you don’t have any in your spice cabinet, I highly recommend you buy some! 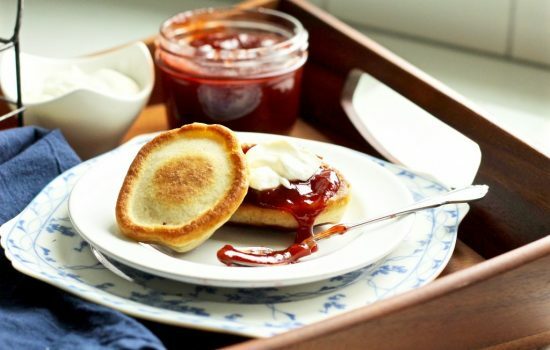 But you can use black pepper in a pinch! 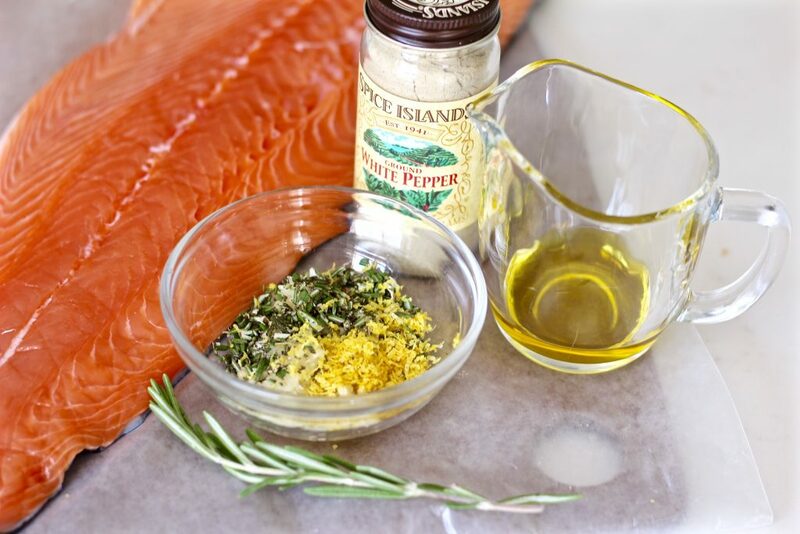 Turn fillet over and drizzle 1-2 tablespoons of olive oil then rub it in. Season with kosher salt and white pepper. Remember to use more salt on the thicker end of the filet as there is more meat to season there. Squeeze the juice of about a quarter of the lemon over the salmon. 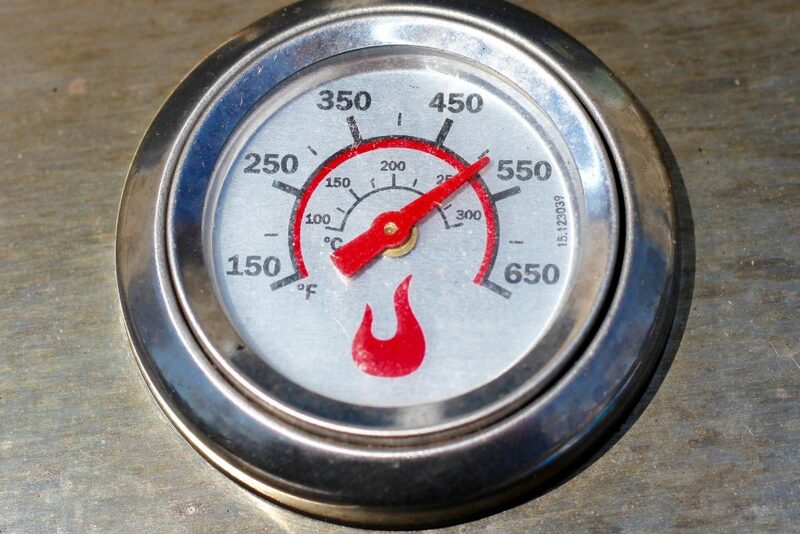 Preheat grill to about 500 degrees. 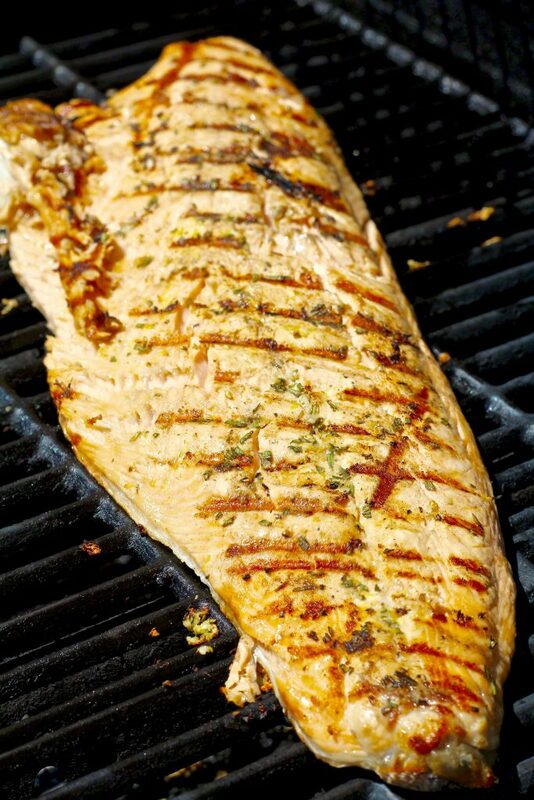 Place salmon face down (skin side up) on the grill and close the lid. Grill without moving for 4-5 minutes, then flip fillet over to the skin side for an additional 3-4 minutes (until the skin gets crispy). 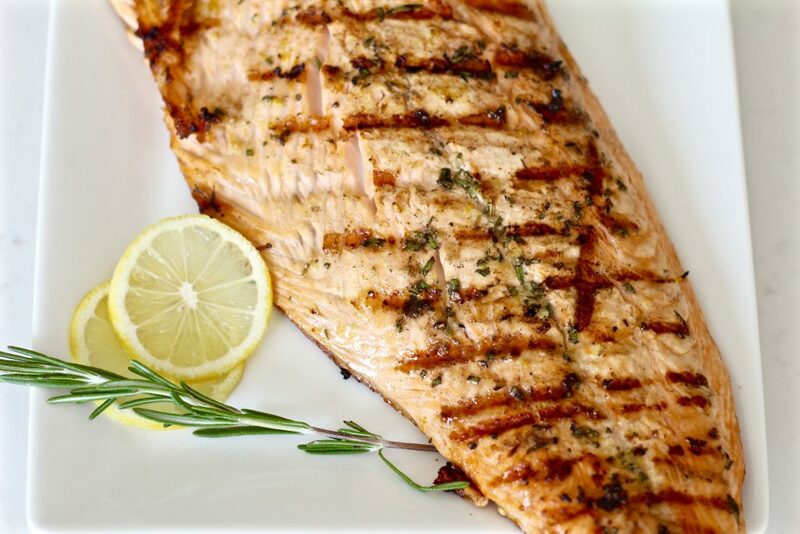 Remove salmon from grill and serve with your favorite side dishes! 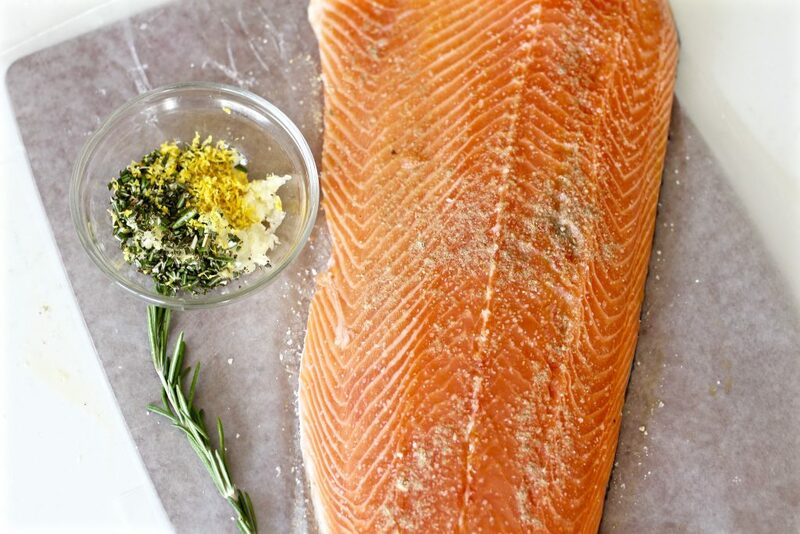 The meat slides right off the skin for those who prefer skinless salmon. 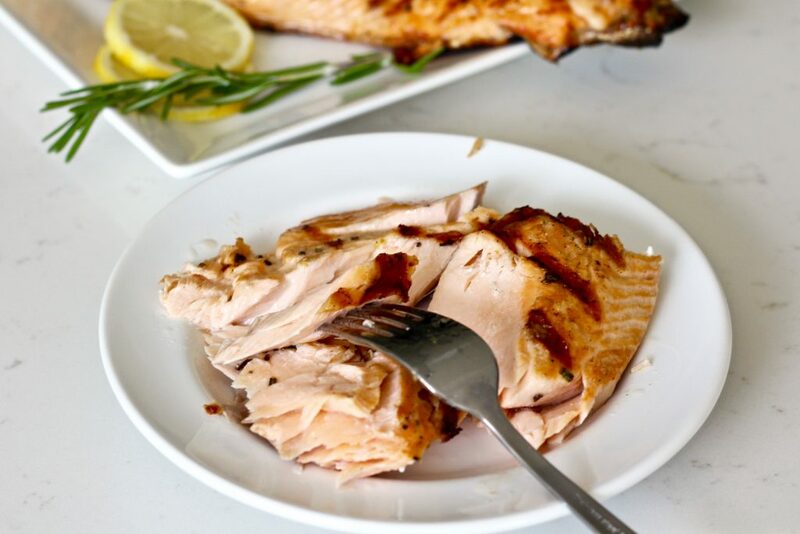 Once you try this juicy grilled garlic rosemary salmon, you’ll be making it all summer long (and maybe even in the fall & winter?)! 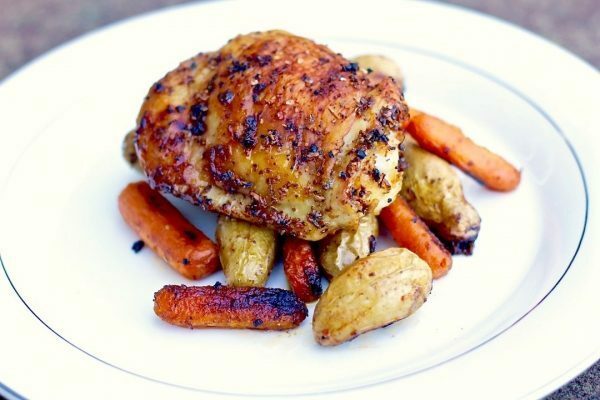 It’s so fast and easy to prepare and grill and the flavor is amazing! 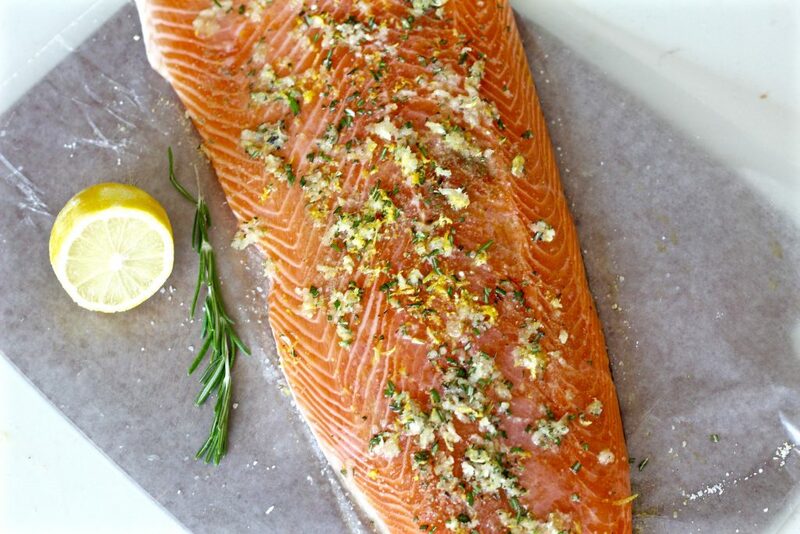 Prepare the salmon filet by pat drying it with a paper towel. Turn filet over and drizzle 1-2 tablespoons of olive oil then rub it in. Season with kosher salt and white pepper. 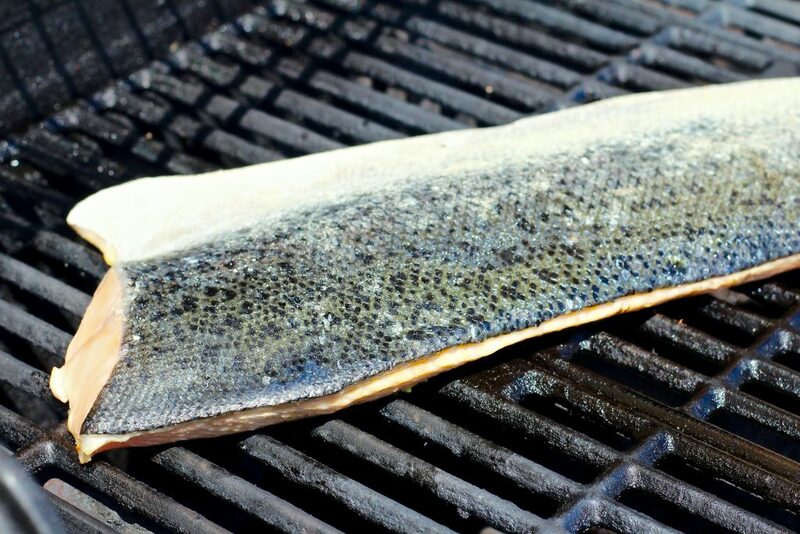 Grill without moving for 4-5 minutes, then flip filet over to the skin side for an additional 3-4 minutes (until the skin gets crispy).